4 Mile Creek Horses is located in the foot hills of the Ozarks, between Batesville and Searcy, Arkansas. 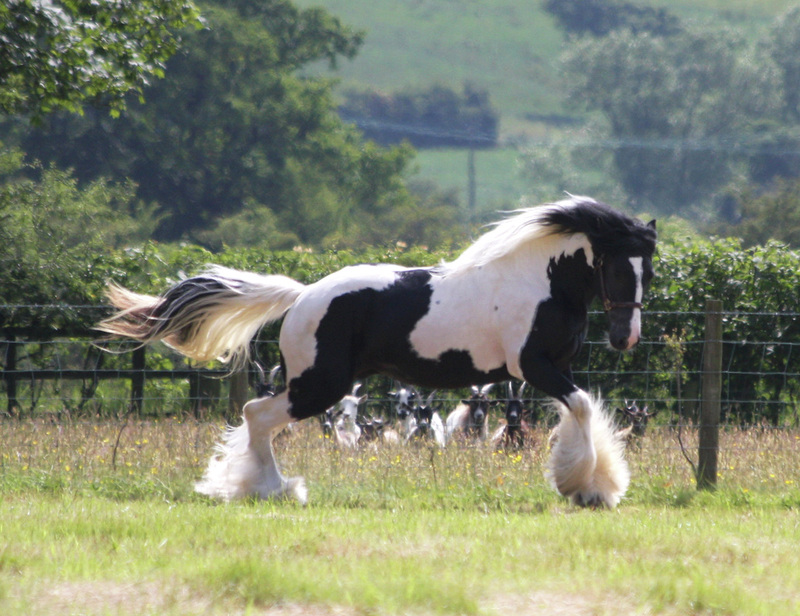 We raise Gypsy Vanner Horses and naturally gaited, head shaking- smooth walking Tennessee Walking Horses, Spotted Saddle Horses and Racking Horses, with quality bloodlines. Traditionally a “cob” in the UK was a comparatively short-legged, sturdy type with an easy-going nature. Ideally, a small head, which probably brought about the saying that “A Cob should have the back end of a cook and the head of a lady”. Fairly heavy boned and of medium height with obvious draft influence; even so he could pick up a good pace when in harness and was also very popular as a hunter/jump mount. 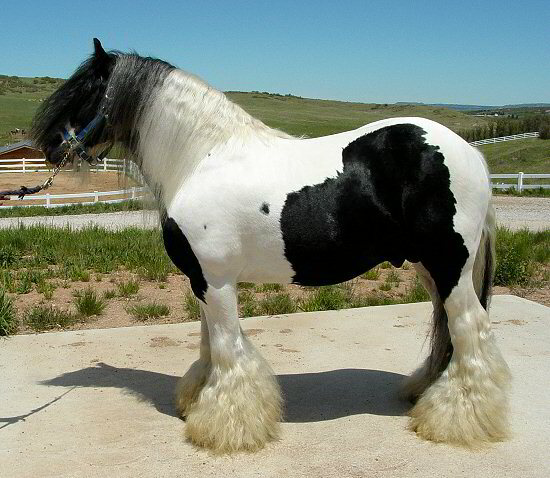 The Gypsy Horse has been bred in a true cob mold but also with the unique qualities, as described above, for which the Romany folk bred. The Gypsy Horse gains popularity with each new person he meets. He is an “all-around” horse – equally suitable for riding or driving, and is healthy, hardy, and strong. He is the answer for the average horse-loving family who longs for a horse that is easy to manage and keep, and who meets the needs of young and old alike. He has a warm, loveable nature which is active, kind, intelligent, and willing. According to description he had to be “fleet of foot, a good jumper, a good swimmer and able to carry a substantial weight on his back”. He also had to be capable of drawing heavy loads of timber. Throughout the ages he has flourished and worked, often in poverty-stricken conditions. This was the sort of life that has shaped the Gypsy Horse what he is today. 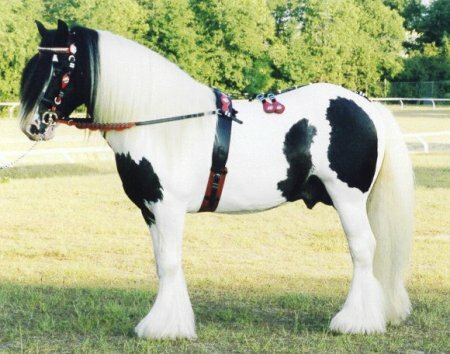 The Gypsy Horse; also known as the Gypsy Cob. Gypsies or Travelers as they are known today, have bred and used the colorful gypsy horses to pull their ornate living wagons and carts through the country lanes of the UK. Traditionally the gypsy horse was involved in every aspect of family life. The beautiful mane, tail and feather, exceptional disposition and heartiness are the trademarks of the Gypsy Horse. The GHRA is dedicated to maintaining the overall appearance and conformation of the traditional Gypsy horse that graced the families of Travelers for years. The Gypsy Horse Registry of America DNA test each horse to parent qualify when parental DNA is available. Extensive records are kept on each and every horse that has ever been registered through the GHRA. ~ The Gypsy Horse Registry of America, Inc. The Gypsy Horse is a relatively new breed in the United States, and is also known as the Gypsy Cob, Gypsy Vanner, Romany Cob, or Tinker Horse. The Gypsy Horse Association (GHA) is a registry that welcomes all lovers of this amazing breed, and recognizes all breed names currently in use. 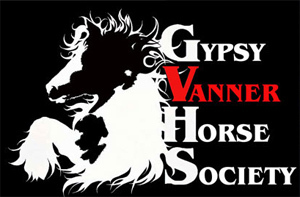 The Gypsy Vanner Horse Society was founded November 24, 1996. 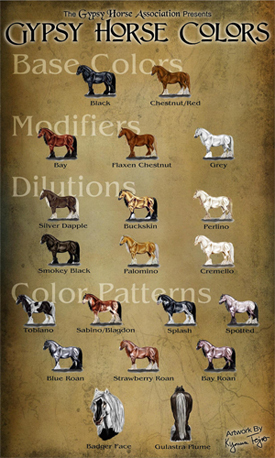 All breeds result from a crossing of breeds by someone or some culture focused on creating a specific looking horse born from their dreamed image – their vision. Once the ideal horse is achieved and recognized, the basic function of a breed society is to protect, educate about, perpetuate and promote the breed. With our breed and the magic it holds, the opportunity is greater. Soon after World War II, a vision was born by the Gypsies of Great Britain to create the perfect caravan horse; “a small Shire, with more feather, more color and a sweeter head” was the goal. 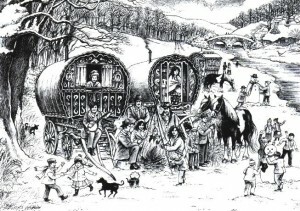 VANNER in the English Chambers dictionary means “A horse suitable to pull a caravan”.